The Portland Company developers are ready to move forward with the marina expansion. One of the comments mentions removal of the old Grand Trunk pilings; is that going to be part of this project or is it best to just let them be for eternity? I believe I read that the pilings are going to remain, although I can't remember the specifics on why. Prentice says there will be an announcement on the development's progress in the next couple weeks, I assume that means above and beyond the marina. Apparently that building would replace the 3-story brick building with a drive-through car port that's currently there. Lots of new renderings of the Shipyard site in the documents for the Planning Board this week. Reading some of the documents I was disappointed to see that the engineers are basically saying it would be too difficult to put the utility wires underground on the Newbury Street side of the project, and so we'll get a streetscape like below. If I were purchasing one of these expensive new townhomes I wouldn't want these poles and wires right outside my windows. Walking down India Street over the weekend I had to laugh when I looked at the just finished Mason Block condos -- the windows and decks on the 3rd and 4th floors of the India Street side are mere feet away from huge tangles of wires and poles. I don't understand why we can't get our utility wires underground on the peninsula. Nice improvement on the color choice for the Kennebec Street building. I agree with putting utility lines underground, must be a combination of cost and laziness. Was surprised to learn that the current building on Fore is going to be demolished, I think it was built in the late 70's and appears to be in excellent shape. 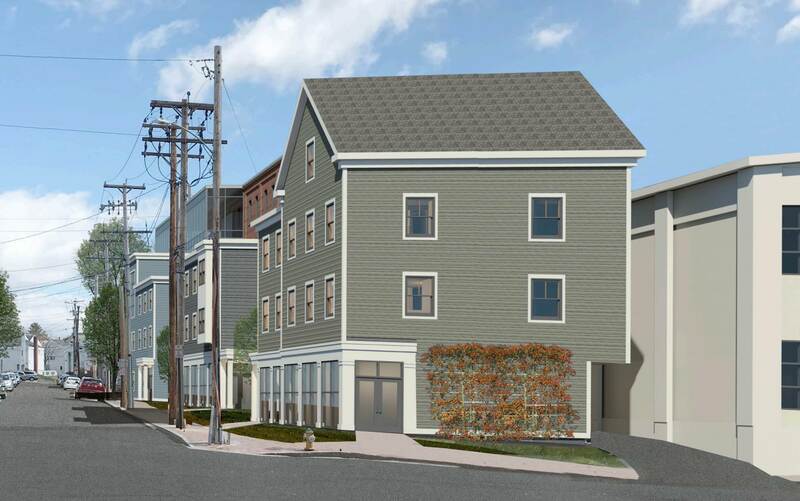 From the renderings, the new condo building does not seem to go that far west on Fore Street to require the land. Not emotionally attached to the structure being torn down but am I missing something? Yeah, I like the updates to 178 Kennebec Street as well. I think that building and the Glickman Library diagonally across the highway will compliment each other nicely with that color scheme. Last edited by Dr. StrangeHat; 07-23-2018 at 01:04 PM. I think the above ground utilities might be part of the reason 62 India St is having trouble selling units, who wants to buy a Condo when your view has those wires in the way?? Shortsighted thinking on the developers part. Also really striking me how large the office component of the Newbury St project is. Might be the largest office building to go up since 84 Marginal Way back in 2008. “We have a couple of different projects in the works. 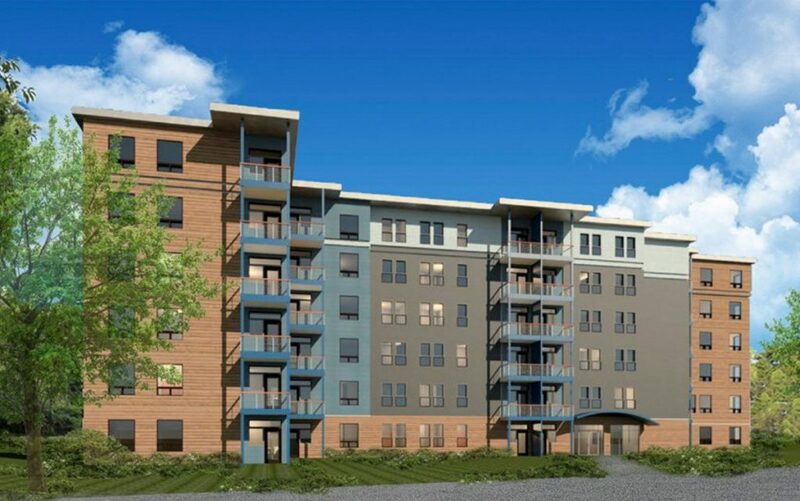 You can expect to see site plan applications in the summer and fall,” developer Casey Prentice said July 11 about what is now called Portland Foreside. 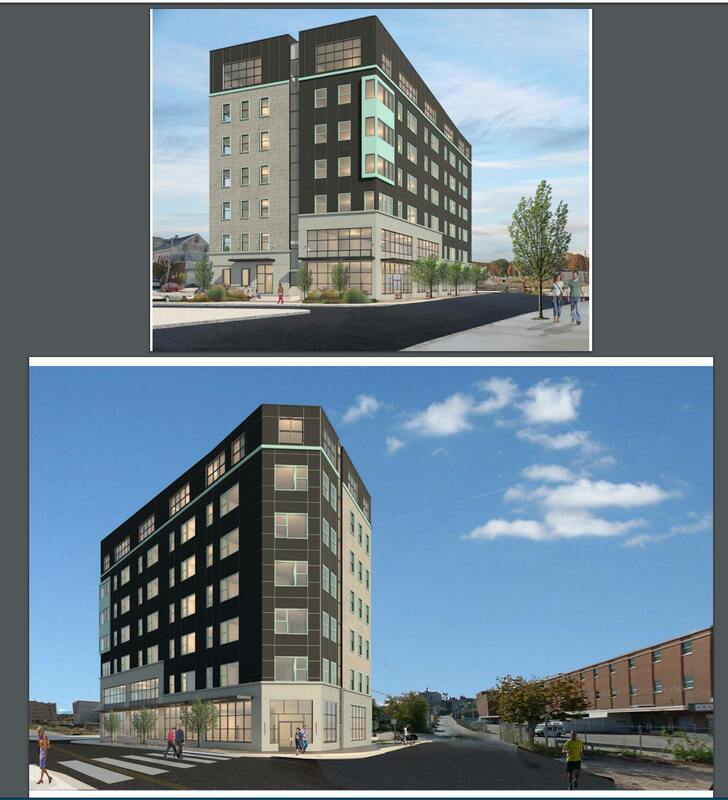 First-phase plans call for the renovation of existing buildings on the property, once home to the Portland Co. About a year ago, the partners reached an agreement to have West Elm operate the hotel that is expected to be part of the first phase of development. Most mockups envision keeping all or most of the pilings in place for a variety of reasons. 250 apartment units in 4 six story buildings. Looks like the new owners of 385 Congress St (former Gannett property) have submitted site plans for a 16,000 sf parking garage with access from Cumberland Ave. That square footage does not sound to impressive and am not sure how it equates to the actual size (levels) of a parking garage? Maybe it's the first phase of something more substantial. The way I read the application, they're not planning to change the existing building at all. It sounds like they're just requesting the ability to park some cars inside the building. You are correct Max, just read an article in the Munjoy Hill News. Such a waste of land (from Myrtle to Franklin) except for the various owners who have been collecting parking revenue for five decades. Two major developments have been proposed over the years that never materialized, maybe someday! I believe that would leave only one other tenant in that complex. With the new WEX building on one side, and a proposal for a major redevelopment of 100 Fore Street on the other, I wonder if 144 Fore Street gets torn down, turned into parking, or otherwise redeveloped in some other way? Seems like their minimum parking requirements would make anywhere on the peninsula basically impossible. I also don't fully understand why they can't be near railroad tracks, seems to be no reason other than making it harder for themselves. 144 Fore would be a difficult lot to develop given its odd shape and the development around it. It willl be hemmed in by WEX on one side and a parking garage on the other (former hamilton marine building) and of course the future Moutfort st. extension. Thames St. extension is moving ahead. And of course the Mayor has an issue with the previously approved funding for the extension. Money towards potential development and long term revenue in Portland's hottest market versus his personal agenda on where he thinks the money should go. I saw in the latest MaineBiz real estate transaction listings that 75 Chestnut Street was sold and closed earlier this month. This is the lot for the Planning Board-approved "Westerlea View" 7-story loft development. I wonder if the project will now move forward? 75 Chestnut St., Portland: 0.33 acre sold to J&B Partners LLC by A&M Partners for $1.25 million. Tony McDonald of CBRE | The Boulos Co. and Jeff Clark of Maine Real Estate Network brokered the deal, which closed Aug. 6. That's Bernie Saulnier's LLC, which has taken over the project. He's also developing the Fort Sumner condo project on Sheridan Street. ...which features the 75 Chestnut project prominently. So, it's been three weeks past the time he said he would make that announcement. That guy has no sense of public relations, unlike Jim Brady, who was "forced" out of the project. Sorry to say, this project is going to be something similar to Thompson's Point, done piecemeal and cheap (with far less cool, excitement). Portland is hot right now, but nothing lasts forever. Next summer Boston is the focus vacation city in New England with The Hub on Causeway, Encore Casino, and more openings in the Seaport District. I'd like to see some of the vacant lots and empty tanks across the harbor in SoPo get developed with an easy access ferry across (that would leave from Ocean Gateway or even the Portland Company mishmash marina). I do think the new WEX building will create some buzz, activity though. And, too bad the new AC Marriott didn't put a rooftop bar and pool on top. Bar Harbor has one, the new West Street Hotel. A very cool place (3D Google map it). Although, I think some relic old Mainer would bring up the rooftop pool incident at the Eastland hotel, way back. Ozzy Osbourne was staying there from a gig at the civic center. They got drunk, they do that, and threw the pool furniture from the roof down to High Street (see the PPH story). Last edited by TC_zoid; 08-28-2018 at 08:31 AM. Has anyone heard any news about the 20 story skyscraper/high rise that was rumored for the old port? I hope it gets done! I drove through Portland a month ago and was impressed with all the construction going on. I live in Manchester, NH and Portland feels much more urban than Manchvegas. What a great little city you guys have there on Casco Bay.